Eternal Orthodox Church calendar for the 29.06 year 2017. 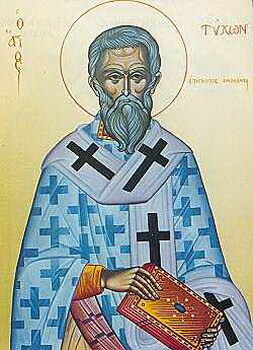 A wonderworker, Tikhon was chosen unanimously as bishop on the death of blessed Mnemonius, and consecrated by the renowned Epiphanius for the diocese of Amathus. The purity of his life and his zealous adherence to Orthodoxy recommended him for this rank. There were still pagans in Cyprus at that time, and Tikhon undertook with apostolic zeal to turn the unbelievers into believers, and he had great success in this. After lengthy toil in the Lord's vineyard, he entered into the eternity of the blessed in about 425. 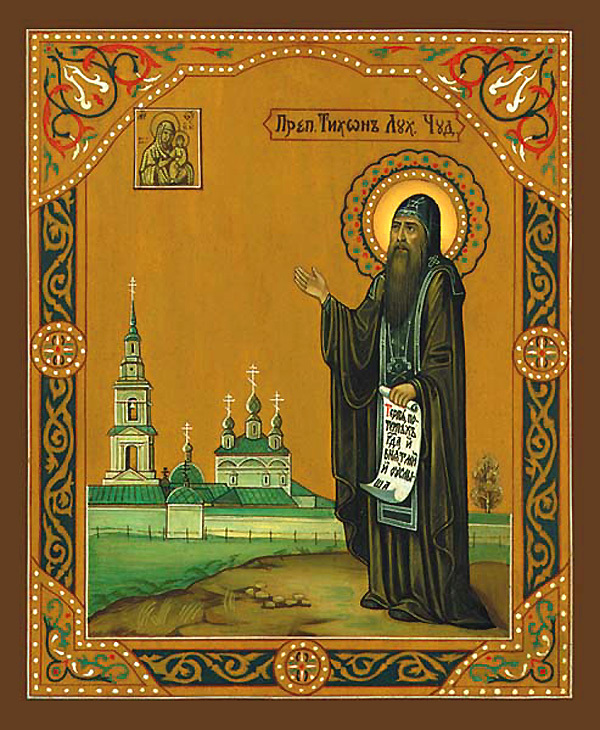 He is named a wonderworker because of the many miracles that he performed during his lifetime. His father was a baker, and whenever his father left him alone in the shop, he would distribute the bread to the poor without payment. His father reproached him once for doing this, so he prayed to God and their storehouse became so full of grain that they could open the door only with difficulty. Another time he planted a dry slip from a vine and the vine grew green and bore fruit in its season. They were both priests with St John Chrysostom. When evil men drove St John from Constantinople, the cathedral was set on fire, the flames from it rising high and failing upon the houses of those who were persecuting this light of the Church. The people saw the finger of God at work in this event, but St John"s enemies blamed his followers for the fire. Many of them suffered because of this, including the priest Tigrius and the reader Eutroplus. 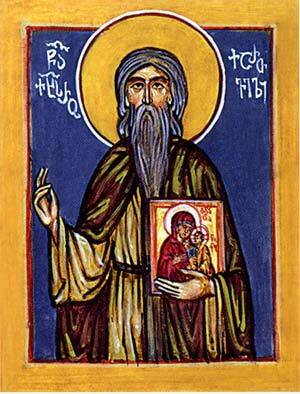 The civil governor, an unbaptised Greek called Optatius, started a particularly venomous hunt for the followers of St John. Tigrius had been the slave of a rich man in his youth, and had been castrated. Set free from slavery, he had devoted himself entirely to the service of the Church and shone in that service like a ray of light. Optatius gave this "meek, humble, merciful and hospitable" man over to vicious torture and then sent him into exile, to Mesopotamia, where he died while still in captivity. Eutropius, chaste and pure from his earliest youth, without vice or guile, was flogged with bull-whips and staves and finally hanged. When Christians took his body for burial, a melodious angelic chanting was heard in the sky above them. On this day also is celebrated the memory of 5 Nikomedian and 40 Roman Martyrs. The time of their suffering is unknown. The life of St. Kaikhosro the Georgian has been passed down to our century in the works of Archbishop Timote (Gabashvili), a famous Church figure and historian of the 18th century. 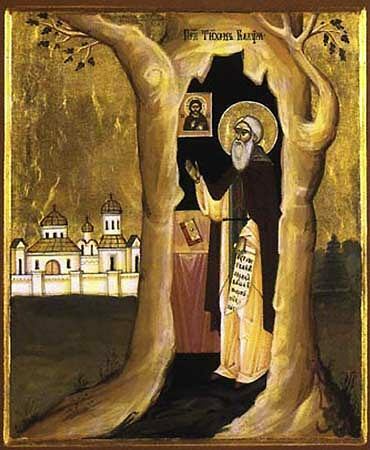 In a passage describing the frescoes and commemoration books of the Holy Cross Monastery in Jerusalem, Bishop Timote writes that an image of St. Kaikhosro the Georgian is among the sacred frescoes. 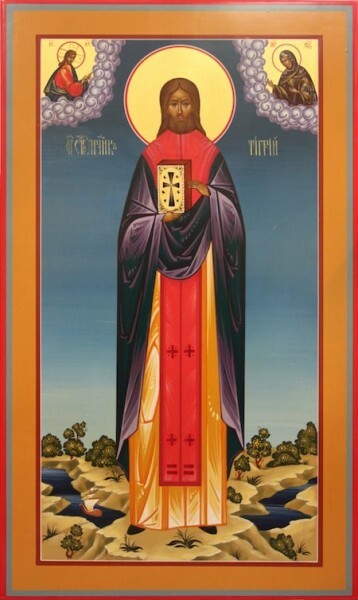 According to the commemoration books of the Holy Cross Monastery, St. Kaikhosro the Georgian was tortured to death by Shah Abbas I in 1612 for his pious veneration of the holy icons.